On Aug. 17, 2017, weak ripples in the fabric of space-time known as gravitational waves washed over Earth. Unlike previously detected gravitational waves, these were accompanied by light, allowing astronomers to pinpoint the source. NASA’s Hubble Space Telescope turned its powerful gaze onto the new beacon, obtaining both images and spectra. The resulting data will help reveal details of the titanic collision that created the gravitational waves, and its aftermath. On Aug. 17, 2017, the Laser Interferometer Gravitational-Wave Observatory detected gravitational waves from a neutron star collision. Within 12 hours, observatories had identified the source of the event within the galaxy NGC 4993, shown in this Hubble Space Telescope image, and located an associated stellar flare called a kilonova. Hubble observed that flare of light fade over the course of 6 days, as shown in these observations taken on August 22, 26, and 28 (insets). The Laser Interferometer Gravitational-Wave Observatory (LIGO) detected gravitational waves at 8:41 a.m. EDT on Aug. 17. Two seconds later, NASA’s Fermi Gamma-ray Space Telescope measured a short pulse of gamma rays known as a gamma-ray burst. Many observatories, including space telescopes, probed the suspected location of the source, and within about 12 hours several spotted their quarry. On Aug. 17, 2017, the Laser Interferometer Gravitational-wave Observatory detected gravitational waves from a neutron star collision. Within 12 hours, observatories had identified the source of the event within the galaxy NGC 4993, shown in this Hubble Space Telescope image, and located an associated stellar flare called a kilonova (box). 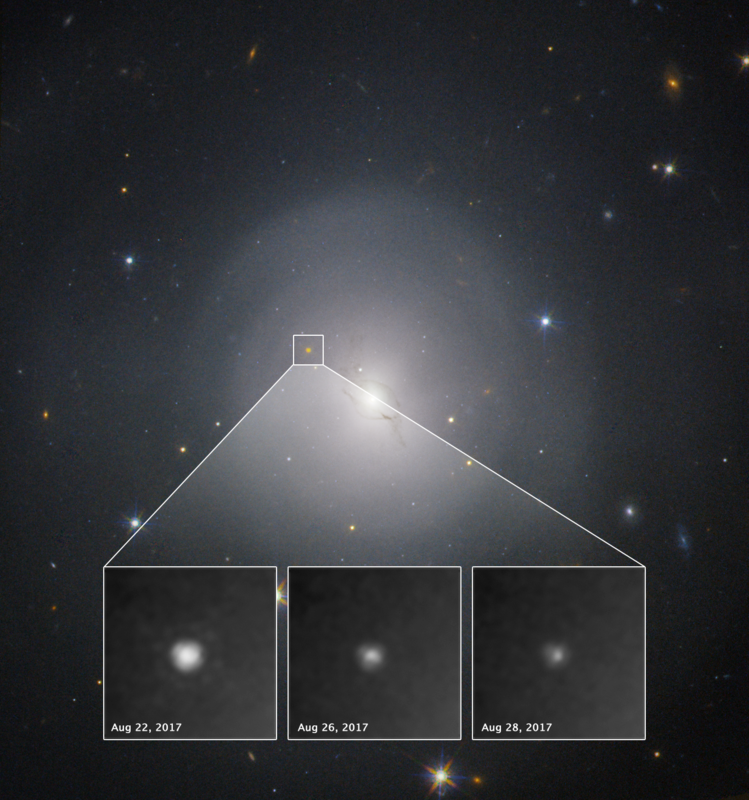 Inset: Hubble observed the kilonova fade over the course of six days. In a distant galaxy called NGC 4993, about 130 million light-years from Earth, a point of light shone where nothing had been before. It was about a thousand times brighter than a variety of stellar flare called a nova, putting it in a class of objects astronomers call “kilonovae.” It also faded noticeably over six days of Hubble observations. “This appears to be the trifecta for which the astronomical community has been waiting: Gravitational waves, a gamma-ray burst and a kilonova all happening together,” said Ori Fox, of the Space Telescope Science Institute in Baltimore. The source of all three was the collision of two neutron stars, the aged remains of a binary star system. A neutron star forms when the core of a dying massive star collapses, a process so violent that it crushes protons and electrons together to form subatomic particles called neutrons. The result is like a giant atomic nucleus, cramming several Suns' worth of material into a ball just a few miles across. “We think neutron star collisions are a source of all kinds of heavy elements, from the gold in our jewelry to the plutonium that powers spacecraft, power plants and bombs,” said Andy Fruchter, of the Space Telescope Science Institute. Several teams of scientists are using Hubble's suite of cameras and spectrographs to study the gravitational wave source. Fruchter, Fox and their colleagues used Hubble to obtain a spectrum of the object in infrared light. By splitting the light of the source into a rainbow spectrum, astronomers can probe the chemical elements that are present. The spectrum showed several broad bumps and wiggles that signal the formation of some of the heaviest elements in nature. “The spectrum looked exactly like how theoretical physicists had predicted the outcome of the merger of two neutron stars would appear. It tied this object to the gravitational wave source beyond all reasonable doubt,” said Andrew Levan of the University of Warwick in Coventry, England, who led one of the proposals for Hubble spectral observations. Additional spectral observations were led by NialTanvir of the University of Leicester, England. “What we see from a kilonova might depend on our viewing angle. The same type of event would appear different depending on whether we’re looking at it face-on or edge-on, which came as a total surprise to us,” said Eleonora Troja of the University of Maryland, College Park, and NASA’s Goddard Space Flight Center in Greenbelt, Maryland. Troja is also a principal investigator of a team using Hubble observations to study the object. The Hubble Space Telescope is a project of international cooperation between NASA and ESA (European Space Agency). NASA’s Goddard Space Flight Center manages the telescope. The Space Telescope Science Institute (STScI) in Baltimore conducts Hubble science operations. STScI is operated for NASA by the Association of Universities for Research in Astronomy Inc., in Washington, D.C.